Well, it's officially the end of the blogging season for me. All of my crafting supplies have been packed in preparation for our move next month to Texas. I must say that I am undecided as to whether I will continue to blog once in Texas or not. I would really like to hear from you all as to whether or not you think I should continue because I'm really torn. 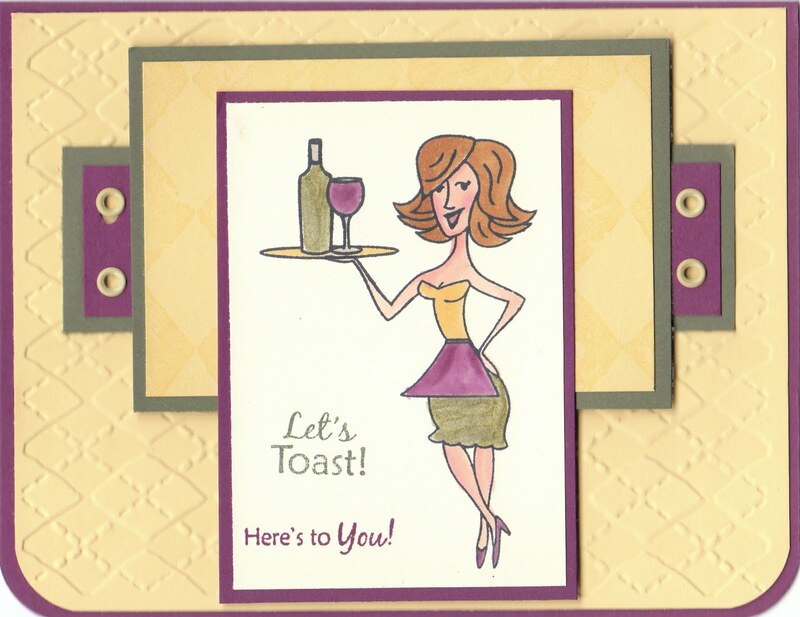 It's a lot of hard work and let's face it, those of us in blogging land really look forward to comments and little notes from fellow stampers. I have to admit, I get really envious of those of you out there who have hundreds of followers with oodles of comments after each post!! On the other hand, I tell myself...don't be ridiculous, do it because you enjoy it...and I do! Oh well, I'm sure I'll figure something out over the next couple of months. Regardless of what I decide to do, I will definitely be keeping up with all my fave bloggers out there!! 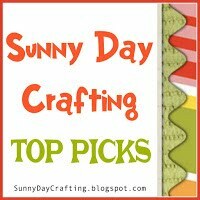 The cards I have to share with you today are just two that I put together on a whim. 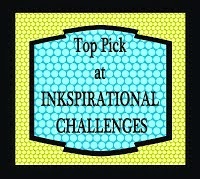 They aren't for any particular challenge. The top one is a 4 1/4 square card. I started with a Chocolate Chip base and the pattern papers are from Basic Grey's Indian Summer collection. 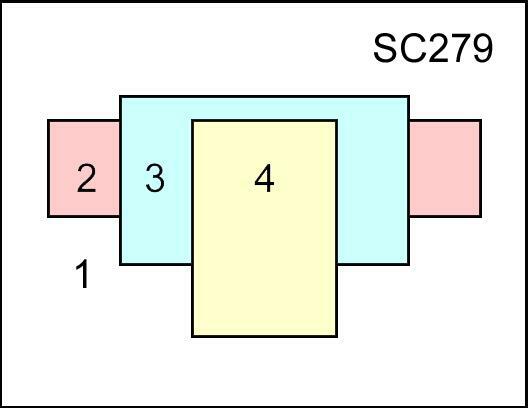 I used Label 1 Nestabilities for the center panels. 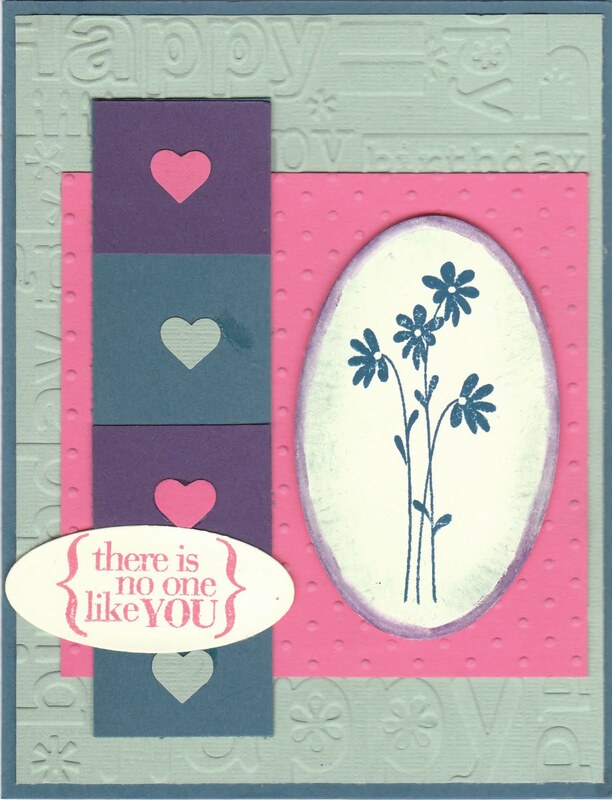 The sentiment is from OCL's "Say it Big" and the flower in the bottom corner is from OCL's "Fabulous Florals." I colored it in with Copic Markers E04, R32 and R34. Easy peasy...took about 30 minutes to complete. The second card also uses a Chocolate Chip base. I put a piece whisper white matted on to a piece of Sage Shadow towards the top of the card. I added a strip of Kraft card stock which I punched with my Fiskars scalloped edge punch and then I layered Brocade Blue at the bottom that I ran through my CB with the swirls embossing folder. I wrapped a piece of Choc Chip grosgrain ribbon around the front as well. 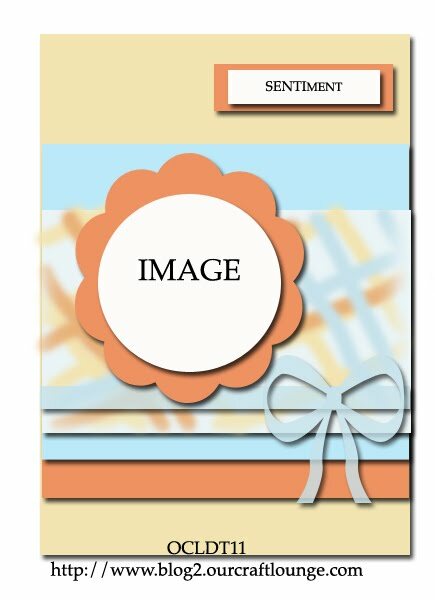 The sentiment in the center along with the swirly looking cut out piece are from Little Yellow Bicycle's "Friends" set. 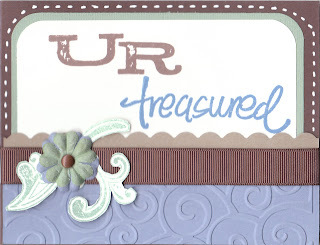 I stamped the "UR" in Memento Cocoa ink and the "treasured" in Brocade Blue. The swirl was stamped in sage shadow and then cut out. I added a prima flower with an antique copper brad in the center and adhered it to the front of the card with a stampin' dimensional. 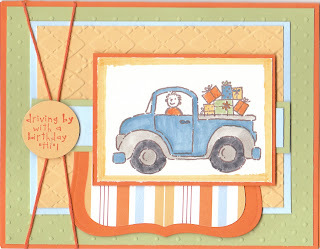 Finally, I drew the line of faux white stitching around the top half of the card. Ok, so I hope you like these. Drop me a line and let me know what you think! Have a great day! Nest I put a 1 1/4 inch strip of Celery with a 1 inch strip of Bashful Blue across the center. 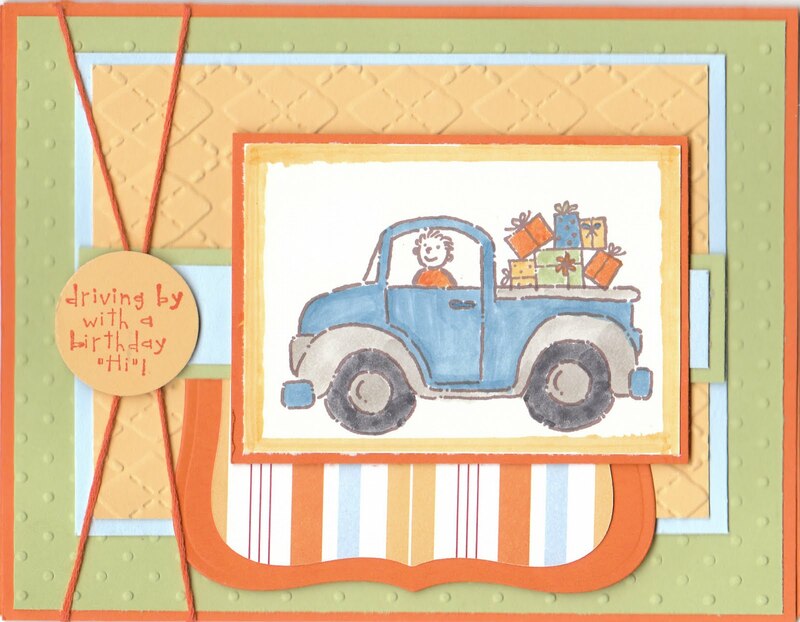 I stamped the truck from SU's Loads of Love set in Memento Rich Cocoa ink on Whisper White cardstock. I colored the main body of the truck with B45 Copic Marker. The bottom trim and center of the wheels were colored with W3. The outer portion of the tires was colored with SU's Going Grey marker. Finally, I took my Y21 marker and made a border around the edge. I mounted the image on a square of Pumpkin Pie Paper. 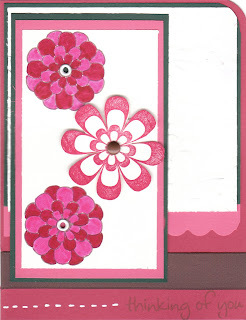 The next card, is just a simple one I decided to make the other day that was inspired by a card I found in Paper Craft Magazine. This one was super easy to make. (Although, I just realized how crooked the bottom strip is!!) 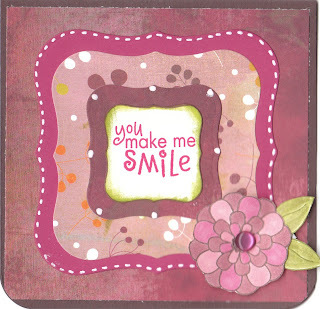 Sometimes simple is best and this was one of the cards I made this past weekend when I was trying to rediscover my mojo. The front of the card is a piece of green paper from a package of earth tone card stock I got from Michaels. The two pattern strips on the left side are from Prima Marketings Sasha Collection. I punched two scallop circles in the same green and one in Pink Pirouette and then added two flowers which came from Making Memories. 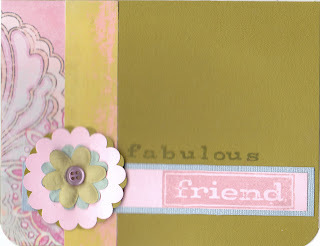 The "fabulous friend" sentiment is from Little Yellow Bicycle. All in all, I was happy with both of these cards. Drop me a quick line and let me know what you think! Have a great day!! I have, once again, been a bit neglectful with my blog. I would have to say there are a variety of reasons for that. 1) The weather is warm and we are spending more time outside. 2) I have packed quite a bit of my stuff away already since we are moving next month to Texas. 3) The biggest reason of all, is probably that I just haven't had any mojo...nada...zip and no desire to do any stamping. Yep, it's true. I hit a big old stamping slump!! This past weekend, the hubs was out of town and I found myself more in the mood to be creative. I think it had to do with the fact, I could spend more time in the evening working on things without feeling the rush to put it away. 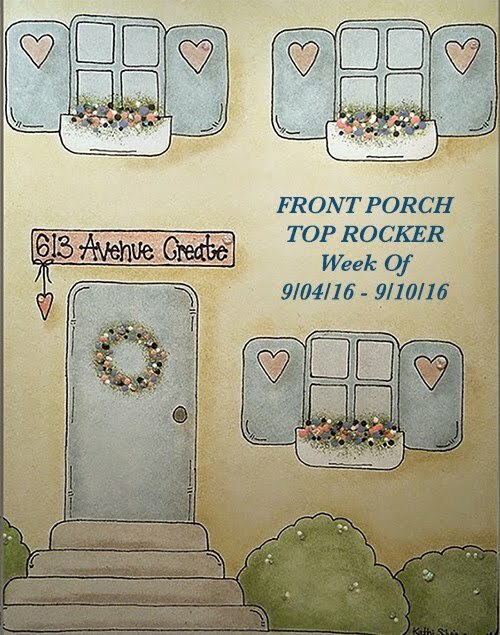 So, I actually did 4 cards this weekend, and I am sharing two of them today and I'll show the other ones over the next couple of days. 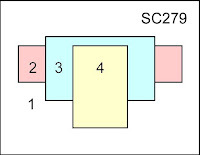 The first card is for the past week's SCS sketch challenge. I used Melon Mambo, Soft Suede, Pink Pirouette and White (The Mambo and the Suede were part of last week's color challenge)The felt and prima flowers in the corner are from a package of Buttons and Blossoms from Making Memories. 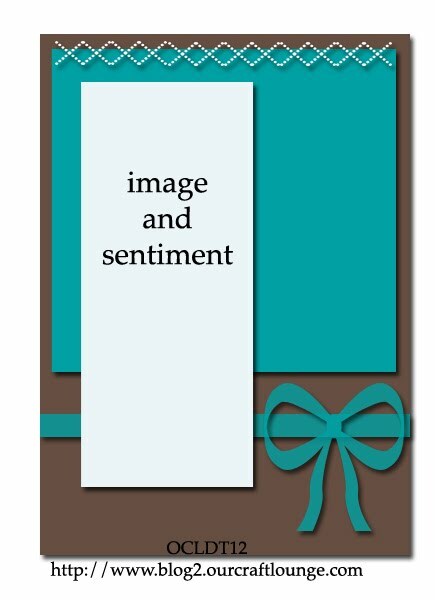 It's all really self explanatory, so I'm going to move to the next card I have for you. 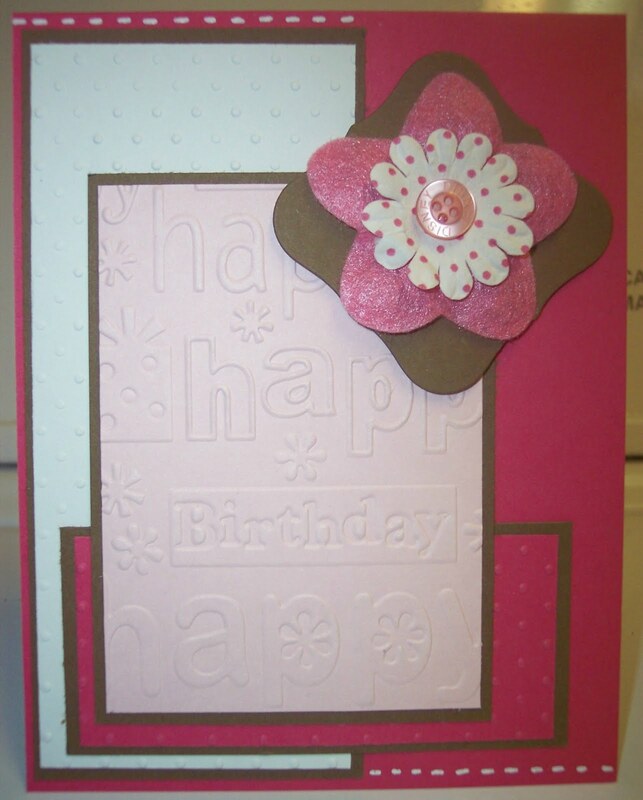 This is for Friday's OCL DT challenge from Our Craft Lounge. I used Pacific Point, Celery, Basic Grey and White for my color palet te for this one. I stamped the Certainly Celery piece with the Hero Arts Circles Pattern cling stamp. I used the Top Note Die from SU for the white piece in the middle and then used Label 8 Nesties for the Grey and inner white piece. I cut another piece out in celery the same size as the white piece and then trimmed it and glued it around the edge. Say it Big was my OCL stamp set of choice for this week's challenge. Ok, so that's all for me for now. Hopefully I'll be back tomorrow with some more things to share with you. Until then, have a great day!! Well, when looking at this card here on the screen, the only thing I can think is "that's not supposed to look like that!" 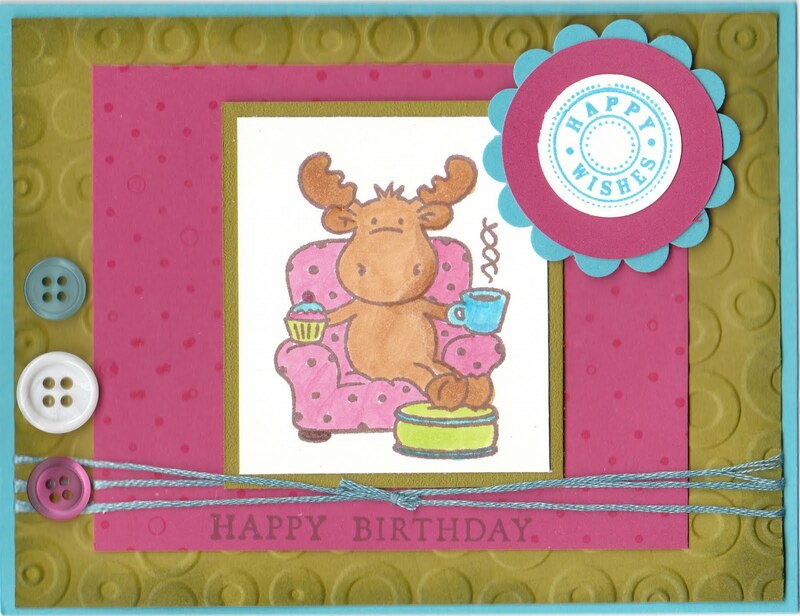 I say this because the embossing that I did with my Cuttlebug on the square white piece is not showing up, so therefore, it looks as though I have an overabundance of empty white on this card. IRL, however I used the Floral Fantasy embossing folder and it does really add a nice dimension to the card! 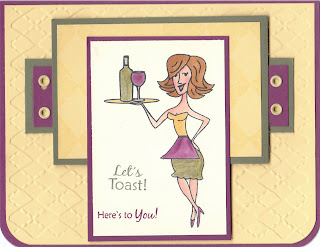 Anyhow...that aside I was pleased with the card, so let me give you the quick lowdown on the details. Last week, when OCL had there blog hop for their newest release, I participated in the hop and dutifully left my comments on the appropriate blogs. Well, guess what?! I won a FREE Set!! How cool is that?!! I won the "Fabulous Florals" set, which was totally awesome because I love this set. I got in the mail on Saturday and so I thought I'd give it a test run for this week's OCL DT sketch. I used Ruby Red, Cameo Coral, Hunter Green and Chocolate chip for my colors. I didn't add a lot of detail to the card, because I was working in a limited window to get it done. Still, not too shabby...what do you think? You know what? I liked that color combination so much yesterday, that I decided to do another card with it. Truth be told, I actually did this one yesterday (I'm just posting it today!) I had all the pieces after making my Hot Betty card that I thought, why not?! 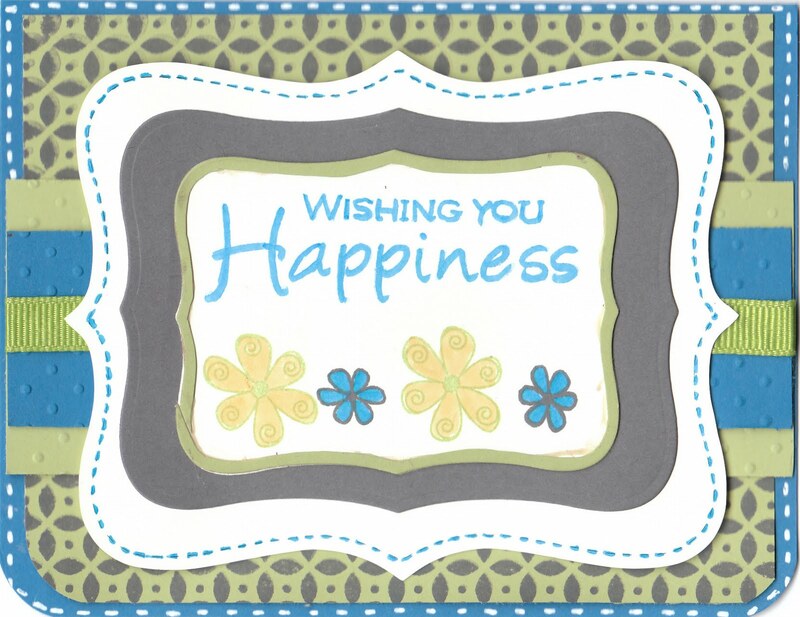 This card is for last week's OCL DT #11 challenge. I know that there will (is) another one posted by now; but I had not had a chance to do last week's and I thought I would get caught up on that before moving to the current one. 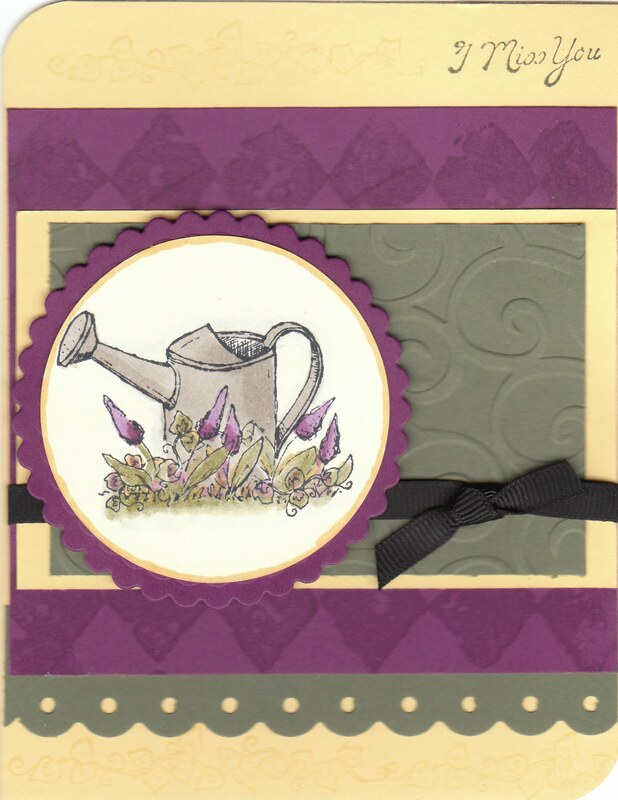 I used OCL's "Garden Thoughts" set. I trimmed the bottom Artichoke piece with the Fiskars "Threading Water" edge punch. 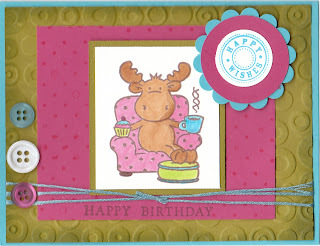 The Razzleberry piece was stamped with versamark and the Print Pattern background stamp. I used my Scallop Circle Nestabilities for the circle behind the water can. Again, I stamped the image in Memento Tuxedo Black ink and then colored it in with W3, V12, Y21 Copics, along with watercolor crayons, ink pads and blender pens. Ok, so that's it for me. Thanks for visiting with me. 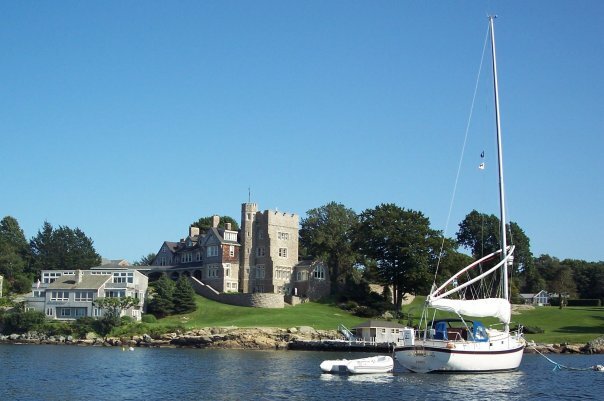 Have a great weekend and I'll see you next week! This morning as I was hopping around in blog land, I noticed that Kristina Werner has issued a new challenge for her readers. 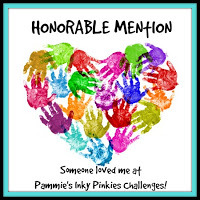 I won't recount the details, you can read about it here on her blog. When you read it, you'll know why I have this picture here. Hope you like it! I love the blues and greens and white in this photo. 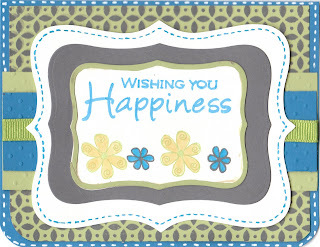 I'll be back in a little while with my card for today. Well, once again I have been seriously neglecting my blog duties. What can I say? The weather is warm and I've actually started to pack some of my things since we will be moving in about a month. The craft fair was this past Saturday and all in all things went well. Sold some things and came home with things. I got a lot of birthday cards and Mother's Day cards in the mail yesterday, and will also be mailing some more later in the month. I've been really inspired by lots of things both online in blogs and in magazines but for the life of me, I just can't seem to get the mojo going!! Such was the case, unfortunately for this week's Mojo Monday card that I just completed. I used Not Quite Navy, Sage Shadow, Coral and Eggplant. I bought a new Hero Arts set at Michael's this week called "Thinking of You" and that is where the sentiment and the flowers came from. I used my Martha Stewart "Heart Confetti" punch for the little hearts that I attached to the NQ Navy and Eggplant squares. Anyhow, just a little something to share with you. Hopefully my Mojo will come back soon! Have a great day everyone!